Hackathons have been an alluring way to celebrate and engage data science community, centered around solving unique business problems. In India, hackathons have gained immense popularity, given a host of advantage it poses—honing data science skills, learn new technologies, identifying areas of interest, forming a community, building reputation in the community—hackathons have been a great way to explore these options. In the past few years it has helped developers push their boundaries and explore their newer selves. To keep the data science community intrigued, we have recently launched an online platform that hosts hackathons and discussion platforms, called MachineHack. It promises to offer an engaging and competing platform, boosting data science professionals to elevate their skills to newer heights. 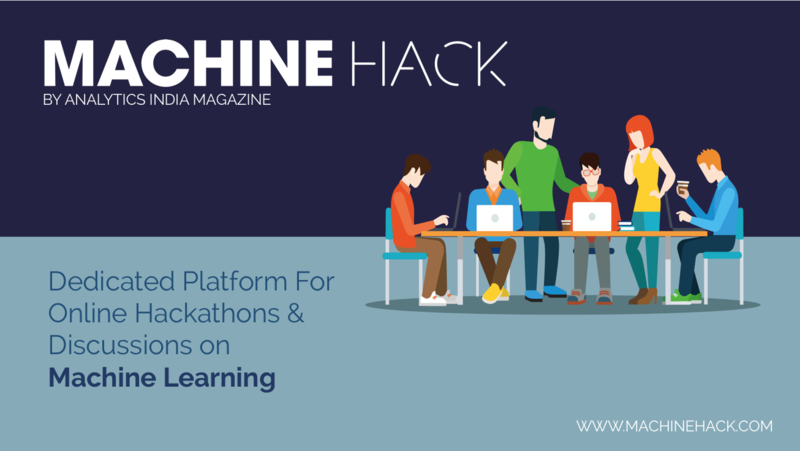 MachineHack offers an online platform where current and future data scientists, machine learning enthusiasts can compete on various real world problems, and find solutions using tools in machine learning and data science. The idea is to bring a platform that can act as a springboard for developers to test, hone and showcase their skills. Suiting both beginners and expert level coders, the hackathons at MachineHack are curated by industry experts and developers, so that it is relevant for data science enthusiasts at all proficiency levels. The platform brings challenging projects enabling them to improve their skills, collaborate and compete like never before. In a nutshell, MachineHack provides an excellent opportunity to test and showcase your machine learning skills by competing against hundreds of data scientists across the country. You can participate in online hackathons designed exclusively by our experts by signing up for free. You can create a username by filling up details like email id, name, location, bio, work experience, organisation working for, among others. Each hackathon lists a detailed overview of the problem statement, along with other details such as background, prizes, evaluation, criteria, duration of hackathon, levels etc. The next step is downloading the data, which comes as training and test data. Based on the training data you have to work on the problem and create machine learning models. Once the problem has been worked upon using your preferred machine learning techniques and tools, you have to submit the filled in test data. Your results are compared to that of others by our team of experts, who would check your submission along with the code, and include your score in the leaderboard. The ones who have the closest proximity to our results, will lead it. This is a major highlight of the hackathons at MachineHack, as your performance in the leaderboard can be a major attraction point for data science recruiters. The other aspect of MachineHack is discussion and collaboration. Each hackathon has a dedicated discussion board, where the participants can collaborate with each other over problems and finding its solutions. This not only provides a platform to upgrade your knowledge, but developing a strong sense of community and network data scientists across the globe. MachineHack will host hackathons designed around NLP, image recognition and other branches of AI in the future. The very first hackathon listed by MachineHack is “Predicting House Prices In Bengaluru”. A beginner level hackathon, it will last over 180 days, where data scientists have to build a model to predict the price oh houses in Bengaluru. The train and test data will consist of various features that describe property in Bengaluru. This is an actual data set that is curated over months of primary & secondary research by our team. Access the complete information here. Facebook Playing Holier Than Thou By Banning Cambridge Analytica. Is It The Real Culprit?